The value of grant funding from trusts and foundations has exceeded the value of grant funding from government sources for the first time since at least 2000, according to figrues from the National Council for Voluntary Organisations. 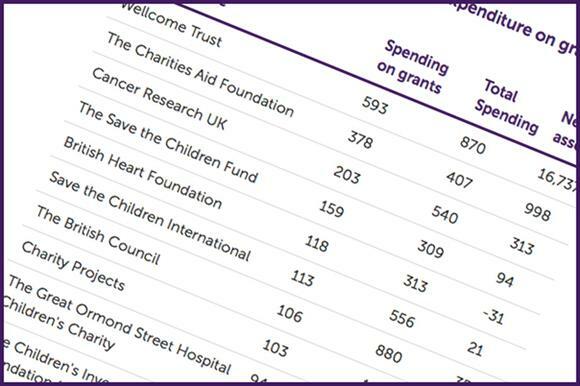 The umbrella body’s UK Civil Society Almanac 2015, published last month, shows that foundation grants to the sector totalled £2.5bn in 2012/13, while government grants totalled £2.2bn. The voluntary sector has traditionally relied more heavily on government sources for grants than on foundations. In 2011/12, the government provided £2.6bn in grants and foundations provided £2.4bn; in 2001/02, government grants totalled £5bn and foundation grants £1.6bn. Karl Wilding, director of public policy at the NCVO, said the proportion of grant funding coming from trusts and foundations was relatively static but could increase if their investment assets performed well amid the higher interest rates the Bank of England plans to introduce. He said grant funding from government bodies such as local councils would continue to decline. "One commissioner said to me the other day that the days of six-figure grants were over," Wilding said. "While I wouldn’t quite go that far, there is some truth in that." Wilding said that in comparison to overall levels of government spending, the £2.5bn foundations had provided in grants was a "drop in the ocean". He said it was more incumbent on foundations than ever to consider where their interventions could make the biggest difference to the future sustainability of the sector and urged them to invest in the infrastructure of voluntary organisations "so that they can change their operating models and do things differently and more cheaply in the future". Overall income from government bodies – including income from contracts – stood at £13.3bn in 2012/13, compared with £3.3bn from trusts and foundations. Cathy Pharoah, visiting professor of charity funding at Cass Business School, said the reduction in grant funding by the government and the increased emphasis on contracts meant that organisations would increasingly turn to foundations for core or development funding. "This is going to put pressure on foundations," she said. She said that grant-makers such as the Garfield Weston Foundation and the Lloyds Bank Foundation were now offering more funding for core costs in response to the changing environment and this would mean a lot less funding for innovation. Pharoah said that some foundations appeared to be wary of funding charities that received large amounts of contract income. "They are wary, and for perfectly good reasons," she said. "They’ll want to be very clear that what they’re bringing to the table is additional. If they were just filling the gaps in the funding provided by government contracts, it would be a case of the agenda being set by the statutory funders." She said she expected foundation grant funding to continue to exceed government grant funding in future, but this was less significant than it might seem because of the increasingly similar characteristics between close-ended restricted grants and contracts. "Although grants and contracts are very different legally, the boundaries between the two can be ambiguous in practical terms," she said. "The expectations and the evidence of outcomes that is required can be similar." Last week, the London-based City Bridge Trust announced that it had increased its annual sum of grants for London charities from £15m to £20m. It said the decision had been taken against a backdrop of increasing need and continuing cuts to services. Analysis: are trusts and foundations doing the right thing?